Today is the five-hundredth anniversary of the birth of Lady Margaret Douglas, daughter of Archibald Douglas and Margaret Tudor, former queen of Scotland. On 8 October 1515, at Harbottle Castle in Northumberland, the former queen was delivered of a 'fair' and healthy daughter, named Margaret after her mother. The day after her birth, Margaret Douglas was hastily baptised 'with such provisions as couthe or mought be had in this baron and wyld country', according to the northern Lord Dacre. Margaret Tudor was ill following the birth, which suggests the delivery might have been difficult, but she departed with her daughter the following spring to the court of her brother Henry VIII at Greenwich Palace, where Margaret Douglas resided in the royal nursery. In June 1517, the former queen and her daughter returned to Scotland. Above: The ruins of Harbottle Castle, where Margaret Douglas was born in 1515. Lady Margaret Douglas has proven to be a popular subject among historians in recent times. Early this year, Mary McGrigor published a biography of her entitled "The Other Tudor Princess: Margaret Douglas, Henry VIII's Niece". Then Sylvia Barbara Soberton charted Margaret's life alongside her friends Mary Howard and Mary Shelton in her book "The Forgotten Tudor Women". Finally, Alison Weir's biography of Margaret Douglas, entitled "The Lost Tudor Princess", was published last week. Why Lady Margaret has suddenly intrigued historians is uncertain, but the likeliest reason is because of her extraordinary life. Replete with tragedy, scandal and love, Margaret was the daughter of a former queen of Scotland, the niece of Henry VIII and the granddaughter of Henry VII, the first Tudor king. She had a claim to the English throne and, it was rumoured, was strongly favoured by her cousin Queen Mary I to succeed her as queen upon her death. Eventually, of course, Queen Mary chose her younger sister Elizabeth to succeed her, but her fondness of her cousin Margaret is apparent in the fact that she considered choosing her as her successor. Above: Lady Margaret's parents, Margaret Tudor (left) and Archibald Douglas, sixth Earl of Angus (right). At an early age, Lady Margaret discovered that her parents' marriage was volatile and uneasy. In 1518, Margaret Tudor learned that her husband was keeping a mistress and violently quarrelled with him. The earl abruptly seized her daughter from her and took her to his fortress of Tantallon in Haddingtonshire before departing with her to France, then to England, and then finally to Scotland. Margaret Douglas' aunt Mary Tudor, youngest sister of Henry VIII, came to her rescue in 1530, when Margaret was aged fifteen, and invited her to London. She resided at Beaulieu on the orders of her uncle Henry VIII. Margaret was a great success at the English court. She was described as being 'beautiful and highly esteemed', and was close to the king's first daughter Mary. She also enjoyed good relations with her uncle's second wife Anne Boleyn. Margaret fell in love with the queen's uncle Thomas Howard and was engaged to him, but the furious king sent the couple to the Tower of London upon discovering their relationship. Margaret also resided at Syon Abbey, finally being released in late October 1537; unfortunately Thomas Howard had already died while imprisoned in the Tower. Margaret was declared illegitimate by the king following the birth of his son Edward. She then went on to serve both Anne of Cleves and Katherine Howard. Margaret foolishly fell in love with Queen Katherine's older brother Charles and was again incarcerated at Syon and Kenninghall for her 'lightness'. The couple's love was short-lived and was probably brought to a close by the queen's execution early in 1542. The following year, Margaret attended her uncle's wedding to Katherine Parr at Hampton Court Palace. 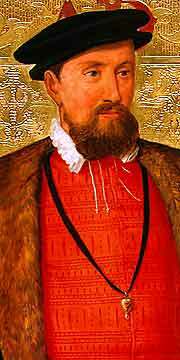 In 1544, she married Matthew Stuart, earl of Lennox, at the age of twenty-eight. The following year, she gave birth to Henry Stuart, lord Darnley (who wed the Scottish queen Mary in 1565). She later gave birth to a second son, Charles Stuart. Susan E. James proposed that a miniature painted by Holbein c. 154o, thought to depict Katherine Howard, actually portrayed Margaret Douglas, countess of Lennox. While I gave credence to James' theory in my biography of Katherine, I have since come to doubt that identification. More probably, the miniature is of the queen. However, the portrait above might depict Lady Margaret Douglas, of which three versions survive. In her biography of Margaret, Weir claimed that the portrait cannot depict Lady Margaret because it is a portrait of Katherine Howard. However, there are sound reasons to doubt this identification. The portrait was, according to the Toledo Museum of Art (which houses a copy of the portrait), painted between 1535 and 1540. It was therefore not definitively painted in 1540 as Weir claims. The Toledo Museum of Art reports that the painting belonged to the Cromwell family for centuries, making it possible, but not certain, that the sitter was a member of that family, perhaps Elizabeth Cromwell (younger sister of Queen Jane Seymour and married to Thomas Cromwell's son). Lady Margaret was in her twenty-first year between October 1535 and October 1536 at a time when, according to observers at court, she was much favoured by the king and his courtiers for her beauty and charm. The age of the sitter in the portrait is also difficult to reconcile with evidence of Katherine Howard's youth; most modern historians are now fairly certain that she was only seventeen or so when she became queen, rather than twenty-one or so. (See Warnicke, 2012; Byrne, 2014; Licence, 2014). There are further reasons to doubt Weir's theory. The version of the portrait housed in the National Portrait Gallery in London dates from the late seventeenth century, many decades after Katherine's execution in 1542. There are no sound reasons why the disgraced queen would have featured as a sitter decades after her death. However, it is entirely possible that Lady Margaret Douglas would have been regarded as a subject deserving of representation in the following century. James I of England became king in 1603. He was the son of Mary Queen of Scots and Lord Darnley and, as such, was the grandson of Lady Margaret Douglas. James was proud of his lineage and appreciated his English ancestry as factoring importantly in the events that led to his becoming king of England. Revering his grandmother's memory, it is surely more plausible that the king would have approved continuing artistic depictions of her in portraiture; it is not likely that approval would have been given to the expense and time spent on painting the disgraced fifth wife of his great-great-uncle. It has been asserted that the portrait depicts Queen Katherine because the sitter is adorned in jewellery that belonged to the queen. However, the king's wife was able to exercise the privilege of allowing favoured women at court to wear her jewellery. Jane Seymour, for example, is known to have made gifts of her jewellery to her lady-in-waiting Mary, Lady Monteagle. Lady Margaret Douglas was the king of England's niece and the highest-ranking woman in the land immediately after the queen and his two daughters. Highly favoured at court, close to both the king and queen, Lady Margaret might well have been painted by Holbein around this time wearing royal jewels. Thus it is entirely possible that this portrait depicts Lady Margaret. In her article on Margaret's life, Rosalind K. Marshall described her appearance thus: 'she had heavy-lidded, deep-set eyes, a long nose, broad jaw, and fairly thin lips', and was both 'lively and attractive'. All of these attributes can be seen in the portrait. A favourite of Henry VIII until her misalliances caused him to doubt her loyalty, it is likely that Margaret sat for Holbein who, as the Toledo Museum recognise, had been employed by the king since at least 1533.